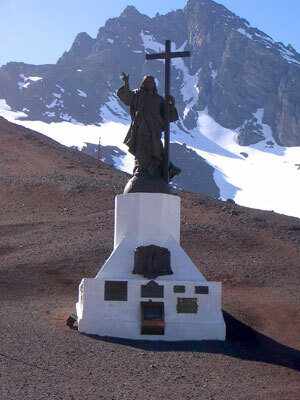 Atop the Andes Mountain range, 12,572 feet above sea level and 20 feet tall, stands a beautiful and intriguing statue. Cristo el Redentor, or Christ the Redeemer, looks out over some of the most outstanding views in Argentina and Chile, and his presence makes a big statement. The statue was raised to these high peaks on February 15, 1904 as a representation of the new found peace between Argentina and Chile. Debate and conflict regarding the official border line came to an end at this time and the statue was placed right down the middle as a manifestation of the harmonious agreement. Today, the same statue remains and patiently awaits visitors with whom he can share his incredible views. This part of the country is full of sight-seeing opportunities and adventures. 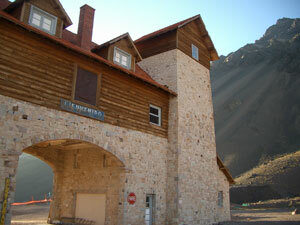 From Mendoza, head toward the Valle de la Luna (Moon Valley), until you arrive at Puente del Inca. 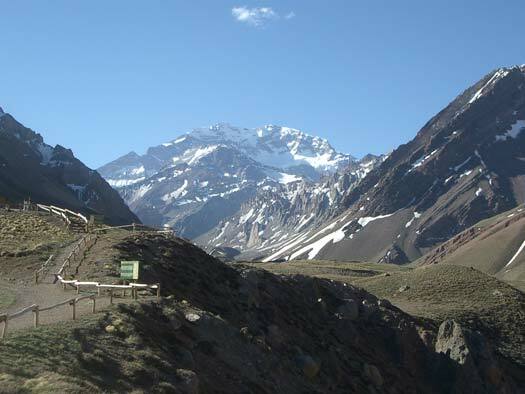 Mountains surround this road in all directions but just beyond the Incan remains sits the biggest and highest of them all, Aconcagua. If you’ve scheduled an additional 14 days into your trip a guided mountain climb is the best way to get acquainted with this peak. You’re getting close to Chile now. 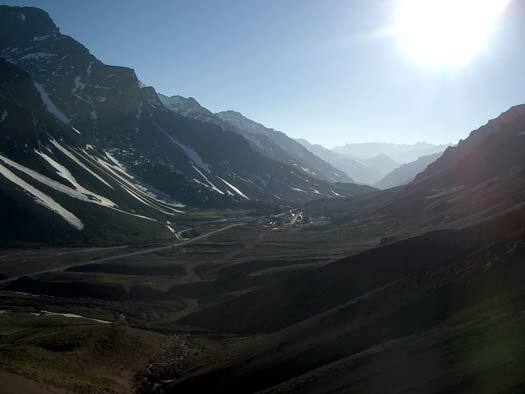 A few small shops and diners are set at the base of the mountains in the distance where you will also see a unique and beautiful hostel, that is only open during high season, and a dirt road directly behind it that zigzags up the mountain. That’s the road you want to take. The dirt road winds around the mountain and after a very slow and careful drive you will arrive at the peak, at the feet of Christ the Redeemer. IF IT IS OPEN! But, if not, don’t get discouraged yet! The shop owners may say its impossible, the people at Puente del Inca may think you are crazy, but if there is one man in the small diner who says that climbing up the ridge of the mountain is feasible, GO FOR IT! It’s not an easy climb, nearly straight up, and eventually you will be walking on snow and ice, but if I can do it so can you. We woke up early to greet the sun coming over the peaks, threw on our layers and laced up our hiking boots. Standing at the base of the mountains, we looked again at the napkin with our pencil sketched map, and headed up the ridge in a slow but steady manner. Each break was worthy of a picture. As we got higher, so did the sun and it lit up the entire valley. Finally it began to level off, and then we reached the snow. Not far ahead we could see where our ridge met up with the dirt road and we understood why driving was not an option. A path barely wide enough for us to walk side by side was all that remained of the road. The packed snow blended the rest of it into the side of the mountain. We followed the road as long as we could and when it disappeared we once again created our own. We were getting close and the adrenaline helped us push our legs forward. Then a small building came into view, and we saw where the snow ended and the mountain came to a peak. Finally we made it! Cristo el Redentor was there to greet us. After 2 hours scaling the mountain, half on dirt, and half on snow, we were very happy to see him. To his left was Chile and to his right was Argentina. Mountains as far as the eye can see. It was chilly and a little windy, but we were able to sit at the base of the statue to block ourselves from the wind and enjoy the incredible views. Eventually we had to pull ourselves away from this indescribable beauty and head back down the mountain. The descent was inevitable but if we could make it up, we could definitely make it down. A trip to Valle de la Luna is highly recommended. There is so much to see and do in this small area. I loved my hike up the mountain to see Cristo el Redentor, but perhaps not everyone would choose to take that route. Arriving in the warm season will enable you to take the road if you prefer. But regardless of how you arrive at the top, it is a trip worth making. This page rendered in 0.209 seconds.